Keltner Channels are a popular technical indicator that traders use to help assess the current trend, spot potential reversals and provide trade signals. The channels use volatility and average prices to plot upper and lower lines, as well as a middle (or average) line. All three of these lines move with the price, creating a channel-like appearance. Day traders can create multiple strategies using Keltner Channels; some of those strategies and uses are discussed below. 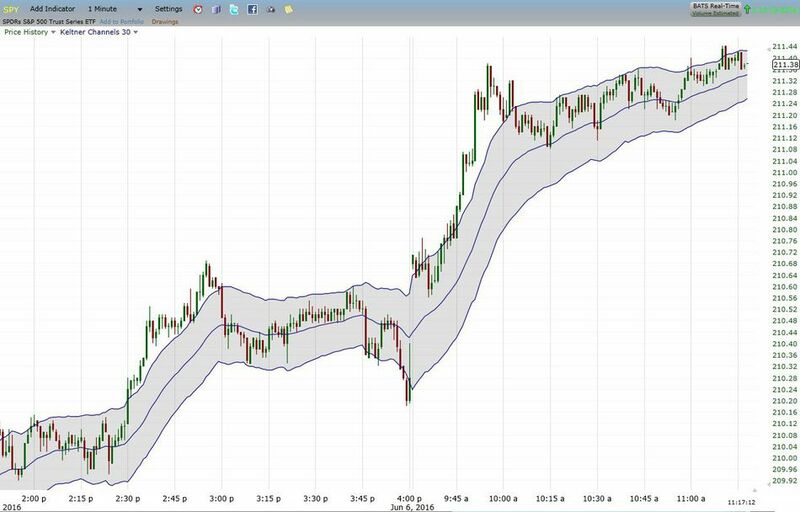 Before delving into how day traders can use Keltner Channel strategies, it's important to understand what you are working with. By understanding how Keltner Channels are created, you are better able to spot the indicator's weaknesses and strengths. Keltner Channels were first introduced by Chester Keltner in the 1960s, but the indicator was updated by Linda Bradford Raschke in the 1980s. This later version of the indicator is the one in use today. The EMA period can be set to anything you want. For day trading, a 15 to 40 EMA is typical. What this calculation does is plot a line above and below the EMA, based on the ATR which is an indicator that calculates how much an asset moves on average over a specific time frame. A common multiplier is two; meaning the upper band will be plotted 2 x ATR above the EMA. The multiplier can be adjusted based on the asset you are trading. While two is common, you may find 1.7 or 2.3 (for example) provide you with better information for the exact market you trade. The higher the multiplier the wider the channel; the smaller the multiple the narrower the channel. Figure 1 (larger version) shows a 30 EMA Keltner Channel, with a multiplier of two for the 30-period ATR. Keltner Channels are useful because they can make the trend more visible. When an asset is trending higher, it should regularly reach the upper band (or very close to it), and even move past the upper band on occasion. The price should also stay above the lower band, and will often stay above the middle band (or just barely dip below it). When an asset is trending lower, it should regularly reach the lower band (or very close to it), and even move past it on occasion. The price should also stay below the upper band, and will often stay below the middle band (or just barely push above it). The indicator should be set up so these guidelines hold true most of the time. In other words, if the price is moving continually higher, but not reaching the upper band, then your channels may be too wide (lower the multiplier). If the price is continually trending higher but often touches the lower band while doing it, your channels may be too tight (increase the multiplier). For your indicator to help you analyze the market, it needs to be adjusted correctly. If it isn't, then the above guidelines won't hold true and the indicator won't serve much of a purpose. Once the indicator is set up properly, the general strategy is to buy during an uptrend when the price pulls back to the middle line. Place a stop loss about half way between the middle and lower band, and place a target near the upper band (stop loss and target are set at the time of the trade). Alternatively, if you find the price is hitting your stop loss a lot (and you have already adjusted your indicator so it matches the guidelines) you can move your stop loss a little closer to the lower band. This gives the trade a bit more room and will hopefully reduce the number of losing trades you have. Short sell during a downtrend when the price rallies to the middle line. Place a stop loss about half way between the middle and upper band, and place a target near the lower band. Alternatively, if you find the price is hitting your stop loss a lot (and you have already adjusted your indicator so it matches the guidelines) you can move your stop loss a little closer to the upper band. This strategy takes advantage of the trending tendency and provides trades with an approximate 2:1 reward:risk ratio since the stop loss is about half the size as the target. Figure 2 (larger version) shows potential entry points along the middle line during an uptrend. Not all pullbacks to the middle band should be traded. Sometimes a trend isn't present, in which case, this method isn't effective. If the price is moving back and forth between hitting the upper and lower band, then this method also won't be effective. Continually check to make sure the market is following the guidelines above; if it isn't, don't use this strategy. The Keltner Channel breakout strategy attempts to capture big moves that the trend-pullback strategy may miss. The breakout strategy should be mostly used near a major market open - such as near the stock market open if trading stocks. This is when the most explosive movement occurs, which favors this strategy. The general strategy is to buy if the price breaks above the upper band, or short sell if the price drops below the lower band, in the first 30 minutes after the market opens. The middle band is used as the exit. There is no profit target for this trade. Just exit the trade whenever the middle band is touched, whether the trade is a loser or a winner. Since the market is typically volatile right after the open, you may get one signal that results in a loss or small profit, immediately followed by another signal. Trade the second signal as well. Only take two trade signals for this strategy in the first 30 minutes. If a big move doesn't occur on the first two Channel breakouts, then it probably isn't going to happen. Figure 3 (larger version) shows two breakouts right after the open. The first is a short trade on a breakout below the lower channel. The trade is quickly stopped out when the price reverses course and hits the middle band. A long trade comes after it when the price moves above the upper band. The profitable trade lasts about 40 minutes; an exit is taken when the price touches the middle band. This strategy is best applied to assets that tend to have sharp trending moves in the morning. If you notice that an asset is fairly sedated and rarely has big moves, then this is not the strategy to use on that asset. Attempting to use this strategy on an asset that doesn't have sharp and volatile moves in the morning will result in many losing trades​ because the price is unlikely to keep running after the breakout (instead the price will likely reverse ). The Keltner Channel day trading breakout strategy is designed for use right around the open of a major market, and only in assets that tend to have sharp and sustained moves during that time. The trend-pullback method is more applicable throughout the day, and the only requirement for the strategy is that a trend is present (that meets the guidelines discussed). If you get a breakout strategy trade in the morning, that trade will end once the price reaches the middle band. At that point, you can decide if you want to take another trade using the trend-pullback method. When using the trend-pullback method, if there were big moves in the morning, but during the course of the day the price flattens out and moves in a very tight price range, then the breakout strategy may become useful again. If the price is tightly compacted, it won't offer good trend trades, but if the price was volatile earlier in the day, some of that volatility may return. Watch for a breakout above or below the upper or lower band to signal a trade and a possible return to bigger trending moves. If using the breakout method during the day, the same exit rules apply; exit when the price touches the middle band. You then can decide if the trend is strong enough to warrant taking another trend-pullback entry. While both these strategies provide entries and exits, it is a subjective strategy in that it is up to the trader to determine the best times to implement each strategy, and which trades to take. Not all trade signals for these strategies should be taken. When conditions are right for each strategy though, they work well. Keltner Channels are a combination of an exponential moving average and the Average True Range indicator. These create a channel around the price action, which provides both analytical insight and trade signals. One way to use the Keltner Channel is to wait for a trend to develop and then enter a trade when the price pulls back to the middle band. For an uptrend, the price should be regularly reaching the upper band, and staying above the lower band. For a downtrend, the price should be regularly reaching the lower band, and staying below the upper band. Another Keltner Channel day trading strategy is to trade breakouts above or below the upper or lower band during the first 30 minutes after the asset officially opens. Take up to two trade signals with the strategy during the first 30 minutes. Only assets that tend to have strong and sustained moves early in the day should be traded with this strategy. The strategy can also be used if there was lots of volatility in the morning, but the asset has moved into a very tight range during the afternoon. You may need to adjust your Keltner Channel settings slightly if you trade different assets. The settings you use on one asset may not necessarily work, or be the best settings, for another asset. Before using Keltner Channels with real money trades, practice using the indicator in a demo account. Practice which trades to take and which to avoid, based on the guidelines provided. Only when you are consistently successful over many practice sessions should you consider trading with real capital.